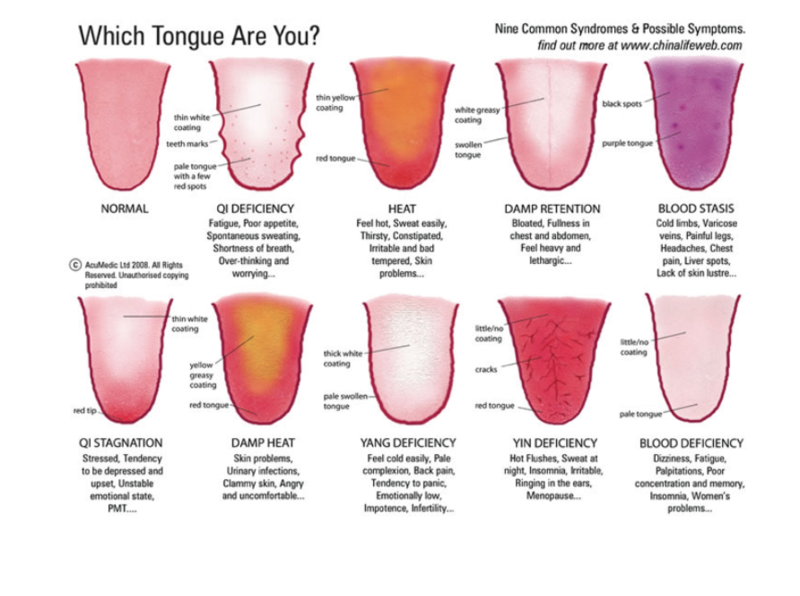 One of the greatest things I learned while studying Ayurveda is tongue diagnosis and how it helps us to look inside and see imbalances and disorders that are happening in the body, even before they manifest as a symptom or disease. Your tongue is a reflection of your energy and state of internal, digestive health. A healthy tongue has a luster and shine to it, is slightly moist, with a fresh-looking pale red color and a thin white coating which cannot be scraped off. The healthy tongue is supple, free of cracks, and does not quiver or tremble. Children’t tongues are usually good examples of what a healthy tongue should look like. Bad breath indicates low digestive ability, and toxic accumulation. Malabsorption is seen when the tongue has teeth indentations on the side of the tongue. Cracks or fissures in the centerline usually indicate back problems. Repressed emotions or spinal column issues are indicated by a deep line down the center of the tongue. Chronic disorders, sensitive nerves, nervous indigestion are revealed by extreme cracks, depressions or bumps. What does Ayurveda say about getting your body back into balance? It always begins with bringing your digestion back to health. I talk a lot about eating for your own unique body type, and how seasonal detoxing can really help figure out if you have any food sensitivities, curb unhealthy cravings, and get yourself back on track with healthier eating habits. But in this blog, I want to also remind you that how you digest and assimilate food is just as important as what you eat. Eat according to your hunger level. Eat at the same time everyday, making your lunch the largest meal of the day. Do not overeat, leave some room in you stomach so you have room to break down the food. Your stomach cannot work efficiently if there’s no room for the digestive fluids to move around in. Cold food is harder to digest, make sure your food is room temperature or warmed to body temperature for easy digestion. Make your food visually and taste appealing. Allow 3-6 hours between meals >>> this means no snacking. Snacking dampens the digestive fires and causes digestive issues in the long run. Chew your food well; digestions begins in the mouth. Eat organic food, mostly vegetables, as much as you can for nutrition and life force. Eat food freshly prepared, avoid leftovers if possible, and do not eat stale food. Eat as relaxed as possible, in a settled environment. If you’re stressed, angry or upset – do not eat, your digestive system cannot properly digest food when you’re not relaxed – this is how the Autonomic Nervous System works. Scrape your tongue daily with a metal tongue scraper from back to front, 7 times every morning prior to brushing your teeth. Scrape your tongue, rinse your mouth, then brush your teeth. You can find tongue scrapers on amazon or health food store. Gargle with triphala water before bed. Recipe: simmer 1 tbsp. triphala powder in 2 cups of hot water for 10 minutes, covered. Pour into a clean and sterile glass jar and store in your bathroom. Before bed each night, swish through mouth for 30 seconds. Notice what taste you taste the most. Notice how it changes through the month. You can order triphala powder at Banyan Botanicals. Swish 1 tbsp. coconut oil (extra virgin) or organic sesame oil through your teeth and gums for 20 minutes in the morning before eating (at first start with just a couple of minutes and work your way to 20 minutes). If your morning is too busy, do it before any meal. Spit into a garbage bag. Don’t swallow or spit down the drain as the coconut oil can clog your drain. Rinse with water or salt water. If you want to learn more on how to up level your daily habits, get more energy, strengthen your immune system, free up more time in your day, and live a life of ease despite what life may bring, join me next month on my 10 week Health Evolution & Body Thrive Program, which is based on Ayurveda and living in rhythm with nature. We start October 16th. You can read more about the program here.